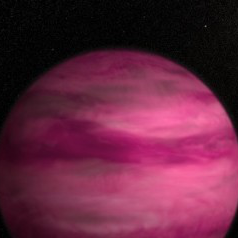 NASA's Goddard Space Flight Center has discovered a new planet - and it's pink. What's 57 light years away from Earth, four times the size of Jupiter, and pink as a Disney princess? The latest planet discovered by NASA's Goddard Space Flight Center, GJ 504b. But the most interesting part isn't its pink hue, it's the fact that its very existence challenges a well-accepted theory of planetary formation. Core-accretion theory states that when bits of debris collect and stick together long enough to produce a core the size of ten Earths, its gravitational force will attract gas-rich particles and continue growing, producing planets the size of Jupiter. The easy answer is that GJ 504b's grew due to this very method. However, it's big - too big for a planet located in an area of space where debris is hard to come by. "This is among the hardest planets to explain in a traditional planet-formation framework," Markus Janson, a Hubble postdoctoral fellow at Princeton University, states. "Its discovery implies that we need to seriously consider alternative formation theories, or perhaps to reassess some of the basic assumptions in the core-accretion theory." It's difficult to say whether GJ 504b will lead to new astronomical discoveries, but one things for sure: Sally Hansen won't be naming any magenta-hued nail polishes after it.